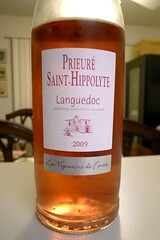 If you love deeply colored roses, pink wines that are nearly red, this will blow you away. Syrah and Grenache make for a chewy, medium-boded wine, with strawberry and cassis notes and a fresh, intense, slightly herbal note on the palate. Saignée method. Lovely with southern French cuisine. Gold medal winner in the Concours Général Agricole de Paris and the Concours des Grands Vins de Mâcon.